Ski school at Canyons Resort. Photo: Rob Bossi/Canyons Resort. Welcome back, ski season! For families undecided on where to hit the slopes this winter, help is here. Browse our picks below for the best places to ski and snowboard in North America with kids, and find the one that suits you best. Bonus: Many of them offer great deals that make a family ski vacation more affordable. Fine print: Must be part of a ski and stay package with minimum adult lift ticket purchase. Maximum 3 children per party (up to 3 children related to at least one adult who purchases a minimum 5-day Ski Banff-Lake Louise-Sunshine lift ticket). Proof of immediate family relationship may be required plus evidence of the age of the guests. “Stay free” applies to shared room. Rates and conditions vary per hotel and are usually dependent on two adults booking in the same room. Fine print: Conditions vary based on individual Tremblant properties. Fine print: Valid February 22-March 15, 2015. Kids also get a free bonus hour midweek at Woolly’s Tube Park and Snowplay Area with every hour purchased. Fine print: Lessons can be taken at Squaw Valley and Alpine Meadows interchangeably to accrue to the 6th free lesson. Lesson accruals are not transferable between kids. Fine print: Parent Ticket is transferable only between the two parents. Fine print: Valid with purchase of a minimum 3-day adult lift ticket. Book by February 19, 2015 (valid March 1-31, 2015) or March 24, 2015 (valid April 1-5, 2015). Package must be booked with lodging through Stay Aspen Snowmass. Fine print: For each paid adult fare (age 18 and above) for flights into Eagle Airport, purchased in conjunction with select lodging, American Airlines is offering one free ticket for children ages 2-12. Book by Dec. 31, 2014. Children also receive free skiing or snowboarding at Vail and Beaver Creek with a paying adult and free lodging with a paying adult at select properties through Vail Beaver Creek Reservations. Fine print: Two-night minimum stay at lodging owned and operated by Keystone Resort. Not valid for groups. Fine print: Kids ski free the same number of days as their parents/grandparents when parents/grandparents purchase a 5-or-more day adult lift ticket. Seniors (ages 70+) must purchase an adult ticket to be eligible for this program. Each qualifying purchase allows one free child per paid parent/grandparent. Children ages 5 and under always ski free but are required to have a ticket. Fine print: Valid January 4-March 28, 2015. One child, (15 years or younger) staying in the same room as the parent, stays and skis for free during this time period. Two children maximum per hotel room or condo unit. Each child will receive lift tickets for the same number of days the parent has purchased. Black out dates apply February 13-16, 2015. Two-night minimum stay. Family deals: Kids 4 and under ski free all season. Family Interchangeable Tickets are available at any ticket window. Fine print: To ski free, kids must accompany a paying adult. Family Interchangeable Ticket: Mom and Dad may purchase two identical alpine lift tickets at the single-ticket price. Only one may be used at any given time. Regular full-day daily ticket pricing applies. Fine print: Valid January 4-21 and March 29-April 12, 2015. Receive up to two complimentary child lift tickets per day and two Deer Valley ski rental discount vouchers for children 12 and under. The purchase of four adult lift tickets is also required. Fine print: Must be accompanied by paying adult. Fine print: Valid January 5-April 5, 2015. For each paying adult, kids 14 and under ski free with a minimum 4-night stay at any Jackson Hole Resort Lodging condominium or home rental (some home rentals may require a longer stay). Fine print: Child must be present at ticket window. Fine print: SuperSaver weeks run January 4-15, January 19-31 and March 20-April 11; SuperSaver rates available over Martin Luther King Jr. holiday weekend on stays of 5 nights or more. Fine print: Must be accompanied by a paid parent or guardian. Want Help Planning a Family Ski Vacation? 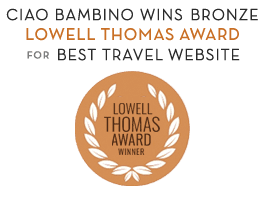 Ciao Bambino’s expert Family Vacation Consultants offer comprehensive trip planning assistance, including itinerary development, hotel selection and booking, and activity and guide recommendations. Request assistance on My Trip Planner. We live in Utah and love having 11 resorts within an hour of home. We skied both Snowbasin and Canyons this week and had a great time! Man oh man, I really should plan a ski trip for next winter before my kids get too old and therefore fearful of falling. I am not much of a skier but I’d love for them to have this skill.